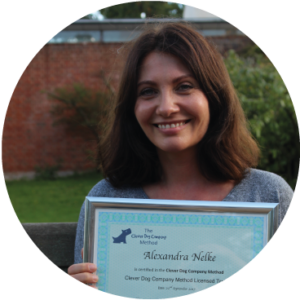 Specialising in bespoke training programmes tailored to the ‘London Lifestyle’, Alexandra has developed effective methods to help owners who live in the city ensure they have happy, calm and confident city dogs. Originally from the German countryside and having spent a childhood enjoying the company of dogs and horses, Alexandra now lives in London and has tailored her methods to be modern, force-free and always with an emphasis on preparing puppies for the busy, city life. With bundles of knowledge on puppy and dog training, she also comes armed with a little black book of contacts and nifty tips; from choosing the right dog walker to knowing all the dog-friendly cafes and pubs in and around the city! If that wasn’t enough, Alexandra also offers a ‘Trained for you’ service to time-poor owners in need of giving their dogs the TLC they deserve, and a more hands-on approach from their trainer.